There are 3 main types of stained glass saw; Ring Saws, Band Saws and Wire Saws and they all have slightly different strengths and weaknesses. 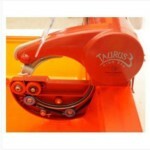 The Taurus 3 Ring Saw is the one I use and recommend. This type of stained glass saw has a cutting blade that is a rigid steel wire ring – about 10cm diameter – that spins at high speed. You cut without turning the glass with these saws. Good for a all sorts of work – probably the most versatile. You can go side to side with them as well as back and forth. 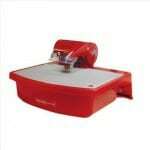 These glass saws have a steel ribbon blade with a diamond coated front edge. They can cut fancy shapes and are faster than wire saws. Good for high production work but you can only go back and forth not side to side. eg. Diamond Laser 3000XL. These saws have a straight wire blade that travels up and down very quickly. Very popular as a bit cheaper than the other two types, with cheap replacement blades. Good for fine delicate work. eg the Gryphon Omni-2 Plus+. They cost about $300-500, £400 for us over the pond. You MUST watch your water levels with the saws. If you don’t you’re asking for problems. A useful tip: use permanent marker lines smeared with vaseline for cutting guide, it won’t smear off with water. Question: I have been making stained glass for 5 years or so now, and have decided that I would like to purchase a stained glass saw for cutting glass in order to lessen my time at the grinder. What type of saw do you recommend? Do you prefer bandsaws or saws that use blades? Can you recommend a specific brand and/or model? What things should I look for or consider when purchasing a saw? Your expert advice is much appreciated. Thank you! Readers Comments for Which Stained Glass Saw Do You Recommend? 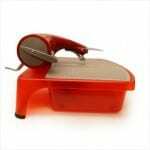 Stained Glass Saw – Is It Worth Buying One? For the beginner or inexperienced stained glass artisan, a stained glass saw may be the end all tool for building panels. In my opinion, stained glass saws have their place and use in the studio, but should not be viewed as something to do all the cutting. Saws are good in cutting some of those difficult pieces with deep curves and where the quantity of glass may be very limited. That’s about the only time I will use a saw to spare aggravation when some glass won’t cooperate. I have a Taurus Ring II Saw and an Inland band saw that I have had for years. Both were rarely used in my studio and used in a pinch when a difficult piece was encountered or there was a very limited amount of glass to work with. Both saws are of good quality, but if I had to do over again, I would have saved my money for something else. If one is proficient in scoring glass accurately, that task can be done considerably faster than using a saw. The saw will basically do some of the finishing grinding and that will save a few steps walking over to the grinding station. But, using a saw is slow. And if one doesn’t use something like hair spray to cut cut lines, the water these saws put on the glass surface will wash them away….leading to some aggravation to the inexperienced user. For the most part, glass saws will sit idle in the studio and used from time to time. It may be better to improve glass scoring techniques by hand rather than having an expensive door stop that is occasionally used. But, that’s just my $0.00000000000002 worth of opinion. Thanks for your interesting and useful comments John. I am of a similar mind for regular glass cutting, but they do have their uses for certain special situations.